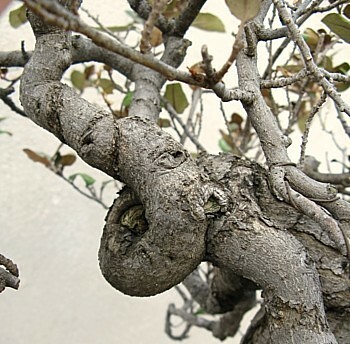 Many years ago at a local bonsai show, I saw the most magnificent, mammoth eleagnus: a four-foot-tall informal upright with nice taper, interesting movement, and wonderful branching. It was my favorite tree of the show and I wished I could have it for my collection. A few years later, what was left of that tree was for sale. Most of the trunk had been eaten by termites. Only a few branches near the apex and one awkwardly angled branch midway up the trunk remained. I understood why the owner wanted to unload it. 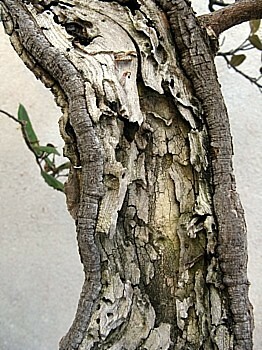 Much of the taper and branching had been eaten away. The height and movement remained, but with most of the trunk gone, the tree seemed fragile and unbalanced. However, the price was so low that I was able to overlook the problems and focus on possibilities. The tree was healthy and I loved the fragrant flowers. The texture on the trunk where the termites had a feeding frenzy was a pleasing distraction to the thin profile. After the original apex died, the previous owner brought up a branch to become part of the new apex. The whimsical movement of one branch was an unexpected delight. To make the most of these features, some serious restyling was in order. The branch midway up the trunk was stiff and brittle. Since it couldn't be positioned at a proper angle, it was removed. 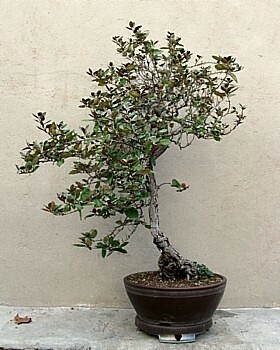 The obvious design choice for this tall, skinny, almost-branchless bonsai-challenged material was bunjin. The few remaining branches needed more length to balance out the elongated trunk, so for a few years the tree was allowed to go wild. Then a wonderful thing happened: a new branch emerged where the awkwardly angled one had been removed. With youth comes flexibility, so I was confident I could bend the branch without breaking it. Before shaping the branches, I needed to find the best front to show off the character and features while hiding the numerous flaws. The upper trunk was the key: it was a bit congested with two branches and the apex emerging from the same area. 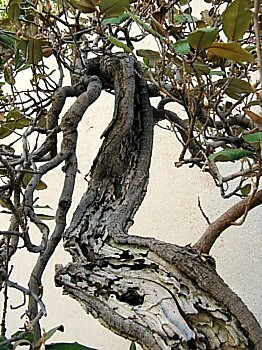 One view showed off the termination of the carved trunk – but positioned the apex and the drop branch on the left perfectly vertical and parallel with the trunk. By turning the tree counterclockwise, the movement in the upper trunk was maximized, the branches had better flow, and the apex had more dimension. Fortunately, the rest of the trunk was also shown to best advantage from this position. The tree now had its best front forward. 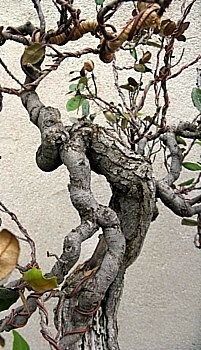 The lower branch on the right had its initial bend downward and close to the trunk, but the rest of the branch needed to be shortened and shaped. 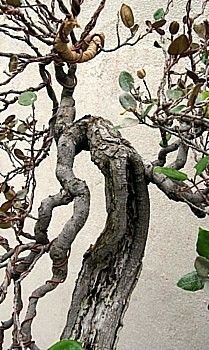 The upper trunk was hidden by an unruly mop of branching. There were more branches than were needed for a thin-trunked bunjin. Because some of them had superb movement and character, they were retained while the remaining were removed. Ultimately about half of the branching and foliage was left on the cutting-room floor. The long, undulating trunk is now a centerpiece surrounded by long and sometimes contorted branches. 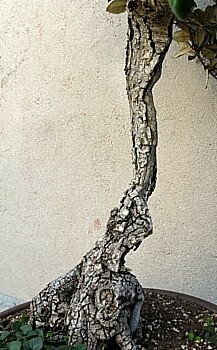 The branches have been shaped to bring the foliage in to frame the trunk. The new glazed pot is predominantly cream which harmonizes with the flowers. A splash of brown on the front of the pot matches the coloring on the underside of the leaves. 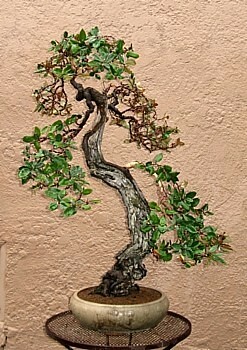 The curved sides of the pot reflect the movement found throughout the tree. The half-eaten tree now seems whole. I no longer dream of that mammoth informal upright of years past; I'm content with my termite-truncated elongated eleagnus. 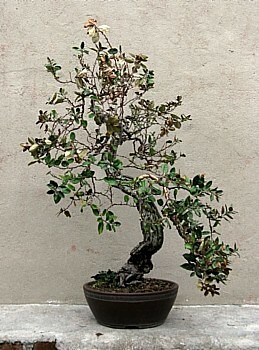 This article originally appeared in Bonsai: Journal of the American Bonsai Society. © 2009 Cheryl Manning. All rights reserved.